A long, long time ago way back in the early 1980's, I sent the president of the US Cavalry Store an idea in how to convert a poncho liner into a lightweight sleeping bag "Poncho Villa" style. Well he liked it so much he immediately replied back and asking if he could use my idea. And I told him, "Sure, go ahead, that's why I sent it to you." Now the only thing I asked of him, is to sell it as a do-it-yourself poncho conversion kit to keep the cost of it down. Well instead of selling it as I suggested, he sold them as poncho liners with the zippers already sewn into them and he was asking a whopping $49.99 each. OUCH! Which back then you could buy a poncho liner without any modifications for about $19.99 from almost any military supply store, on or off the base. So to charge an additional $30 for a $20 poncho liner with a couple of lousy zippers sewn into it seemed to me like a whopping rip-off. Then years later I decided to contact the president of Brigade Quartermaster (Mr. Mitch Werbell) and tell him about my poncho liner conversion kit idea. And yep, he also thought it was a pretty good idea too. But unlike US Cavalry he agreed it should be marketed as a do-it-yourself kit to keep costs down and he called it a "Ranger Rick Poncho Liner Conversion Kit." Well this is what it looks like today in his catalog, check it out. 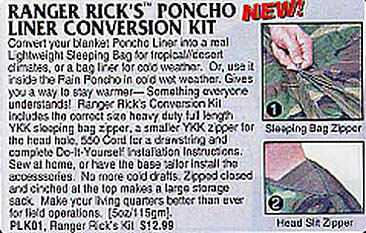 NOTICE: For some unknown reason, after many years of successfully marketing this "Poncho Liner Conversion Kit," Brigade Quartermaster has discontinued selling it. And now, not a week goes by that I don't receive an email or two from somone asking me.. "Hey Rick, where can I buy one of these Poncho Liner Conversion Kits since BQM has stopped selling'em." The answer? Google this: YKK Sleeping Bag Replacement Zippers and up will pop several websites and companies who either make or sell them. IMPORTANT: Depending on your height you will need either a 108 or 120 inch sleeping bag replacement zipper for your poncho liner or blanket. Though the ol' US military poncho liner is still my favorite lightweight sleeping gear to use out in the field, because it's easy pack, roll up and will dry out super quick if it gets wet. There are a few others that I like as well, like those Coleman "Fleece" sleeping bag liners, those heavy duty space blankets and recently I purchased and tested out what's called an"Emergency Bivvy." 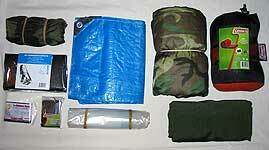 Which is a pocket size, nylon space blanket that weighs only 3.8 ozs and reflects back 90% of your body heat. And these suckers only costs $15.00, well worth every penny. Now for those of you who have served in the military as a Paratrooper, Ranger, Special Forces or a Navy SEAL. 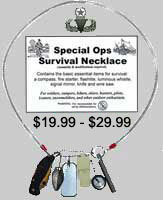 I'm sure you have seen this in some of our military survival manuals, but have you ever made one and tried it out? I have, several times, and it works pretty good too. In fact, I knew someone who preferred to carry one of these because it was a hellova lot lighter and easier to pack in his rucksack than a US military issue sleeping bag. 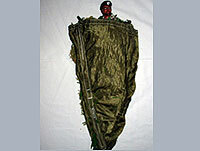 It's a "para-sleeping bag" made out of a few cut up parachute gores & panels. To make one, all you need to do is cut out a few triangle sections and fold'em a certain way like in these photos below. First you have to lay down a bunch of vegetation (leaves & grass) to insulate yourself from the cold ground and to keep yourself dry. 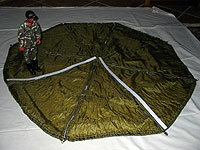 Then lay out and place one section of the parachute down on top of your pile of vegetation and then fold it back over and across another section of the parachute and then again place a whole bunch of vegetation but this time on top of the parachute itself. Then take the last (3rd) section of the parachute and fold it over, across and on top of the leaves & grass you just placed. Then all ya gotta do is carefully crawl inside between these two nylon parachute layers. 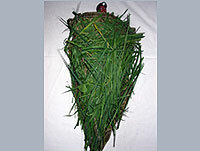 For additional warmth and insulation you can place more vegetation on top of the parachute. The more vegetation you add, under, in between, and on top, the warmer you will stay.